Abstract: Airwheel Z5 2-wheeled electric scooter is the best companion for various age groups. The following features will make you cannot resist the temptation of the newly designed Airwheel Z5 foldable electric scooter. 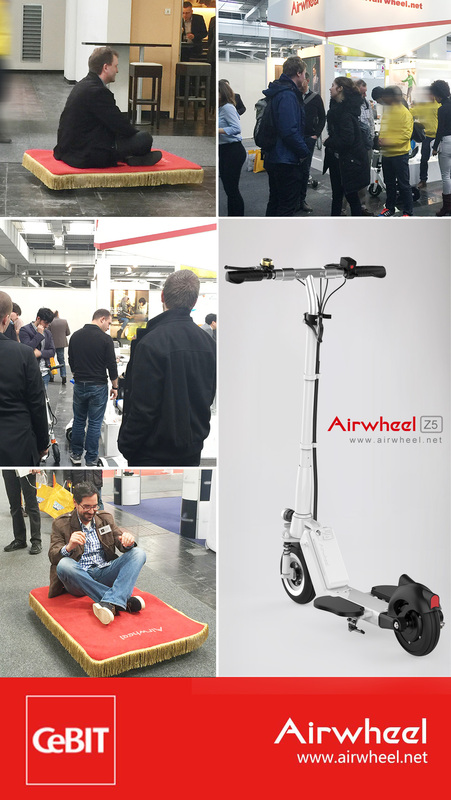 Airwheel Z5 standing up electric scooter is one the new products released on CeBIT 2016. It is the best companion for various age groups. The following features will make you cannot resist the temptation of the newly designed Airwheel Z5 foldable electric scooter. To begin with, the multiple folding systems make Airwheel Z5 rise to prominence. Z5 is easy to fold by lifting and pulling with the innovative foldable handle design. Secondly, modular battery design is designed to be built-out and replaceable. However long the journey is, you can finish it. With the addition of USB interface on the battery, Airwheel Z5 razor scooter for adults gives riders a hand to charge their mobile phones, tablets and other electronic devices during the travel. Thirdly, from the aspect of riding comfort, the foldable pedals that alter the twisty riding stature, riding Airwheel Z5 2-wheeled electric scooter is more in line with the body's daily standing habit, and reduces the burden on both legs, with an obverse standing posture. Plus, convex handle, combined with curved shape design operating rod provides enough room for the hands. To be more beautiful and more comfortable is the charm of S profile. Also, the operating rod can be adjusted for different groups to ensure riding comfort. Fourthly, Airwheel Z5 2 wheel electric scooter aims to provide the smoothest riding experience. Dual shock mitigation systems can conquer various road conditions to enable a smooth and graceful riding. Lastly but not least, specifically developed Airwheel APP that can be connected to Z5 intelligent electric scooter anytime to know the speed, residual power and mileage etc. With the App, riders can check the malfunction to simplify the process of maintenance. Anyway, App is essential in the intelligence era.